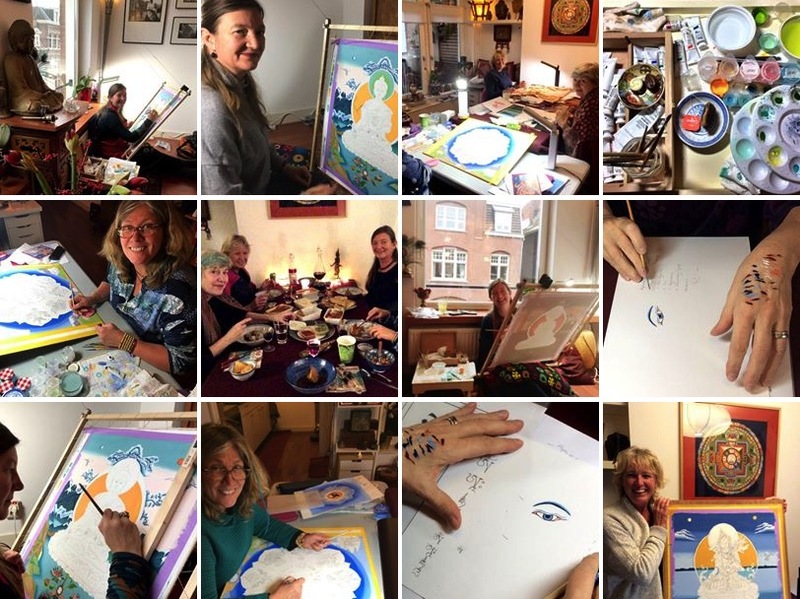 The end of the year was also the ending of the very first Thangka Painting Year Training, that I organized for a small group of more advanced thangka students, in my studio in Amsterdam. In a series of 3 long weekends (three full days) Isa (who was painting Buddha Shakyamuni), Janneke (who was painting White Tara), Margot (who was painting the Medicine Buddha) and Sylvie (who was painting the mandala of the Eight Auspicious Symbols) learned all the aspects of making a traditional tibetan thangka. In between the weekends they would get homework and work on it at home (if they had time), stay in touch with each other and could contact me if they needed help with their artwork. The first long weekend was focused on general knowledge of Tibetan Thangka painting through lectures on the landscape and offerings, creating a reusable thangka frame and canvas, and transferring the drawing (that the students had made in a previous thangka course) onto the canvas. In the second long weekend the thangka students learned all about pigments & paint, how to mix paints, applying the base layers, and learned the different thangka painting techniques and how to work with them. They also learned basic knowledge of different styles in Tibetan thangka painting. The third weekend of 3 full days was focused on the magical power of the Buddhas, preparing real gold for the thangka, applying decorations, the eye opening ceremony, and mantras and blessings on the thangka. It was a wonderful group of people, and new friendships have been made. The students will work further at home and can contact me in between if they need help with their thangka. In Spring 2018 we will come back together to check out all the (probably finished) artworks. 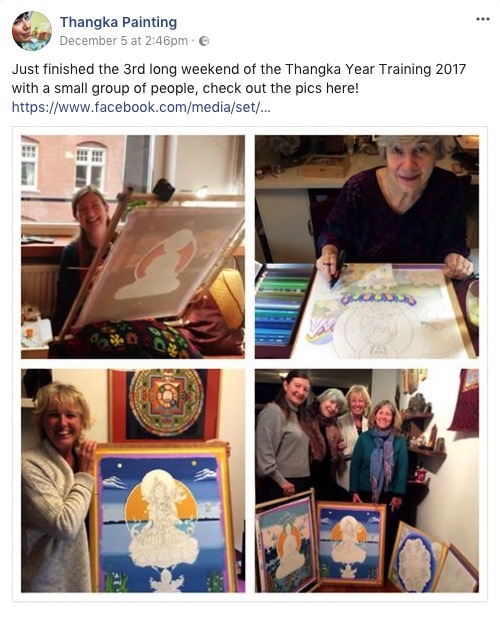 New dates for the Thangka Year Training will probably be starting from the second half of 2018. You can keep an eye on our Upcoming Thangka Classes page, or you can sign up for the Thangka Newsletter, so you will automatically stay informed on future thangka painting courses.